Vienna/Bregenz, July 18, 2014. Wolford AG, a publicly listed company on the Vienna Stock Exchange, announces its annual results for the 2013/14 financial year today. The results are in line with the guidance most recently published by the company. Currency-adjusted revenues in the past financial year (May 1, 2013 to April 30, 2014) could be increased by about 1% to € 157.90 million (2012/13: € 156.47 million). Taking account of the negative currency effects of about € 2 million, reported Group revenues declined slightly by 0.4% to € 155.87 million. Operating results adjusted for non-recurring effects were at the prior-year level: EBITDA adjusted amounted to € 7.11 million (2012/13: € 7.90 million) and EBIT adjusted totaled € -0.97 million (2012/13: € -0.91 million). In spite of non-recurring expenses totaling € 3.76 million in connection with the strategic refocusing, earnings after tax amounted to € -2.81 million and thus also matched the previous year’s level (2012/13: € -2.76 million). Due to the consistent optimization of working capital, Wolford generated a clearly positive cash flow from operating activities of € 6.30 million (2012/13: € 6.31 million) and boasts a consistently solid balance sheet structure with an equity ratio of 54% (April 30, 2013: 55%). “Wolford is striving to achieve the operating turnaround in the current financial year 2014/15. We are determinedly implementing all strategic refocusing measures for this purpose. The product portfolio will be gradually adapted and the collection statement will be sharpened, marketing activities are realigned and intensified, and we are continually optimizing our distribution. We want the organization to be more agile through internal process changes and further enhance our innovative strength”, says Axel Dreher, Speaker of the Management Board of Wolford AG. Currency-adjusted revenues increased by about 1% in the past financial year (May 1, 2013 – April 30, 2014) to € 157.90 million (2012/13: € 156.47 million). Taking account of the negative currency effects of about € 2 million, mainly related to the British Pound and US Dollar, reported Group revenues declined slightly by 0.4% to € 155.87 million. The company’s own retail business continued to generate growth in 2013/14. Wolford-owned points of sale achieved a significant revenue increase of 5%, and the online business also developed very positively, featuring a 23% rise in revenues. In contrast, revenues fell by 8% in the wholesale business, i.e. the business with partner-operated boutiques, department stores and multi-brand retailers. From a regional perspective, revenues developed very differently. The USA, Wolford’s largest single market accounting for 17% of total revenues, generated growth both in the Group and in the local currency. Revenues also increased in the European markets of Italy, Spain, Belgium, Great Britain and Austria. In contrast, revenues in the core markets of Germany and France decreased year-on-year, mainly as a result of the decline in the wholesale business. Wolford achieved substantial double-digit revenue growth in Greater China and the Gulf Region. The quarterly development of revenues shows an ambivalent picture. Following a decline in the first two quarters of the 2013/14 financial year, third-quarter revenues rose due to a satisfactory Christmas season but could not fully compensate the revenue drop in the first two quarters. Revenues also climbed slightly in the fourth quarter. In particular, the first half-year revenue decreases in the wholesale business were significantly reduced in the third and fourth quarter. The negative earnings of the 2013/14 financial year are largely attributable to non-recurring effects and expenses of € 3.76 million in connection with the strategic refocusing. They included expenses for the closing of loss-making points of sale, costs for conceptual and strategy changes, the relocation of parts of the production as well as severance payments. EBIT including non-recurring effects totaled € -4.72 million and is thus in line with the most recently issued guidance of approx. € -5 million. EBITDA adjusted for non-recurring expenses totaled € 7.11 million (2012/13: € 7.90 million), whereas EBIT adjusted amounted to € -0.97 million (2012/13: € -0.91 million), corresponding to the previous year’s level. Savings of about € 2 million were achieved in operating areas due to process optimization measures and in turn led to lower material costs and personnel expenses. The rise in other operating expenses is mainly due to increased rental costs for existing and new points of sale as well as the intensification of marketing measures. Earnings after tax of € -2.81 million could also be maintained at the same level as in the previous year (2012/13: € -2.76 million). As a consequence of the negative earnings, the Supervisory Board and Management Board will propose to the Annual General Meeting on September 18, 2014 to waive the dividend for the 2013/14 financial year. Thanks to the consequent optimization of working capital, especially inventories, a considerably positive cash flow from operating activities of € 6.30 million could be generated (2012/13: € 6.31 million) in spite of the negative earnings. The Wolford Group reported equity of € 74.38 million as of the balance sheet date on April 30, 2014 (April 30, 2013: € 78.15 million). The equity ratio equaled a solid level of 54% (April 30, 2013: 55%), whereas gearing reached 23% (April 30, 2013: 20%). “With the sale of a non-core land and a lease option in the first quarter of the new financial year 2014/15, we managed to reduce net debt by € 10.7 million, which amounted to € 17.04 million as of the balance sheet date. Combined with our strong cash flow from operating activities and the safeguarding of sufficient lines of credit, we have ensured the financing of the strategic refocusing, including the planned investments in core technologies and the expansion of distribution”, explains Chief Financial Officer Thomas Melzer. The focal points of the strategic refocusing launched in December 2013 encompass the adaptation of the product portfolio, the sharpening of the collection statement and the focus on the company’s core business, the realignment of communication in all its facets, the focus on markets with the highest cost/benefit ratio and the global optimization of distribution, including a relaunch of the wholesale business and the strengthening of the online business. The defined measures are accompanied by internal process optimization and organizational adjustments, with the objective to make the company more agile and market-oriented and to further enhance its innovative strength. 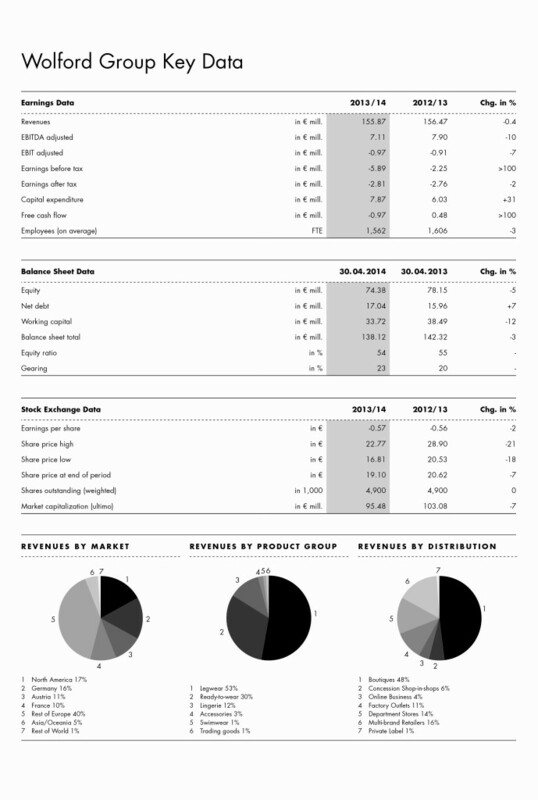 Wolford’s goal for the 2014/15 financial year is to achieve the operating turnaround. Since a book profit of about € 7.4 million was generated in the first quarter from the sale of non-core land and a lease option, Wolford is well on the way to achieving the aspired earnings target. The Annual Report and the Annual Financial Report 2013/14 can be downloaded at company.wolford.com under Investor Relations. Use of photos only until October 31, 2018, and exclusively for editorial purposes.